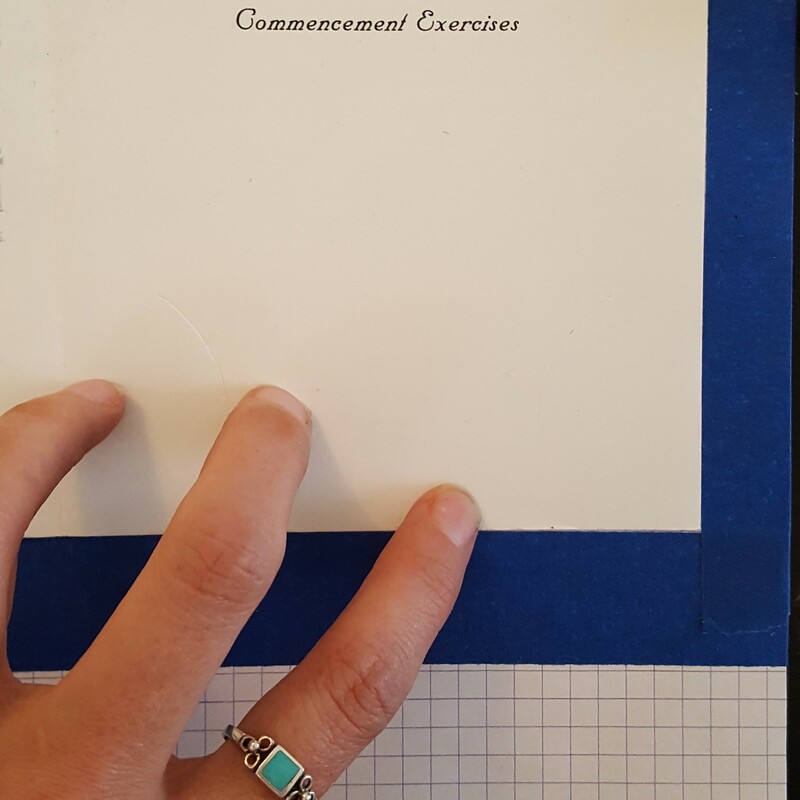 I was honored to letter the invitations for this graduation celebration. The graduate, Chris, earned his Master’s of Science in Planning at the University of Arizona. 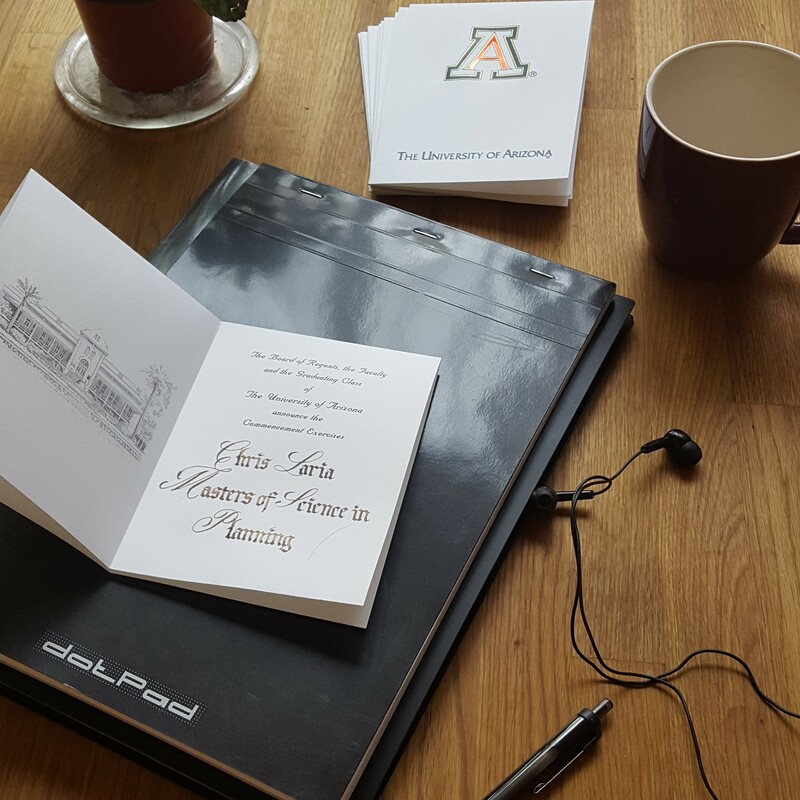 Chris and his wife purchased invitations from the university, which came slotted with a small card for the graduate fill in their name and degree. The cards were promptly recycled and I set to task calligraphing the names. Chris saw a sample of mine and immediately chose that as the style he wanted in the invitations. In the sample, I lettered the capital letters in Engrosser’s Script, a slanted, sophisticated cursive hand and I did the miniscules in Textura Quadrata, a gothic script with straight lines and diamond shapes at the tops and bottoms of the letters. Paired, each script brings out the style of the other. I used walnut ink which dries to a medium brown with just slightly darker edges around each shape; an interesting and classic effect. 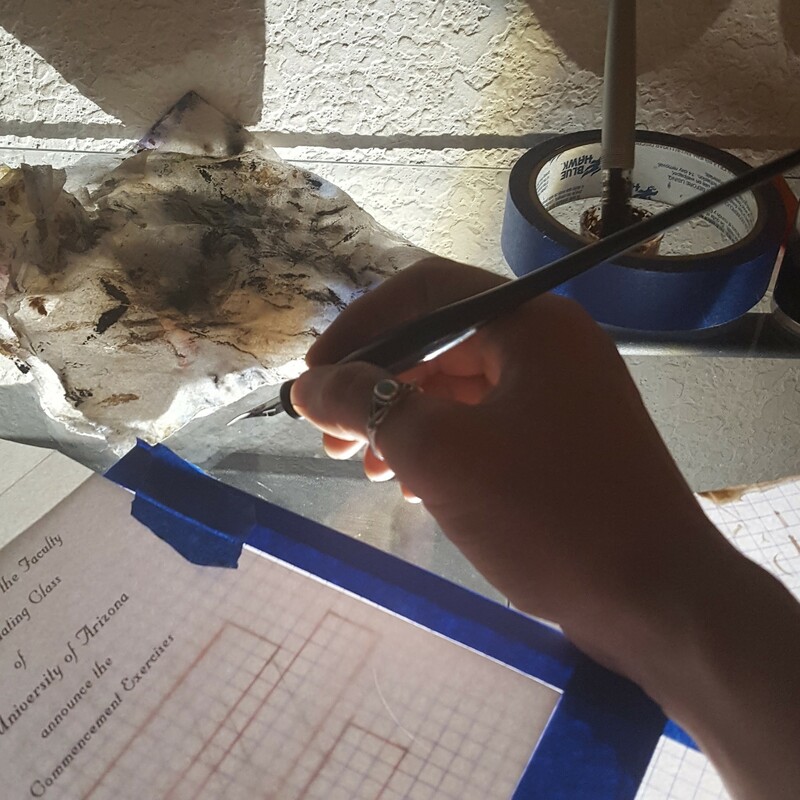 Rather than drawing guidelines on each of the 40 invitations, I decided to use a light table, which can loosely be defined as a work surface that light can be shined through in order to trace an image over one or more pieces of paper. One could even use a window and sunlight if so inclined. My light table is a small hand-me-down glass table with a lamp on the floor underneath it that I shine upward. Even though I was using a light table, let it be known that I am a girl who loves her guidelines and proportions. For this project, I used a small piece of graph paper as a guidesheet. 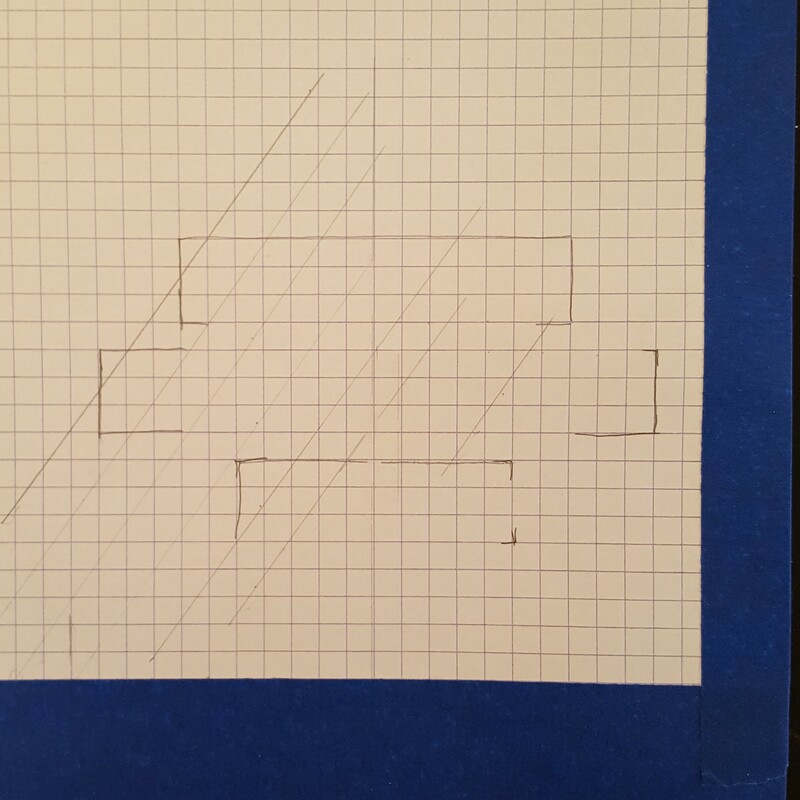 The height of the miniscule quadrata letters is 4 to 5 nib widths which happens to equal one square of the graph paper I like. The proportions of Engrosser’s are one height for miniscules, or in this case square — same for quadrata, and the capitals are three heights. I added 55 degree slant lines to use for the capitals. I practiced the phrase a few times to be sure of the spacing and centering of the words and forms. 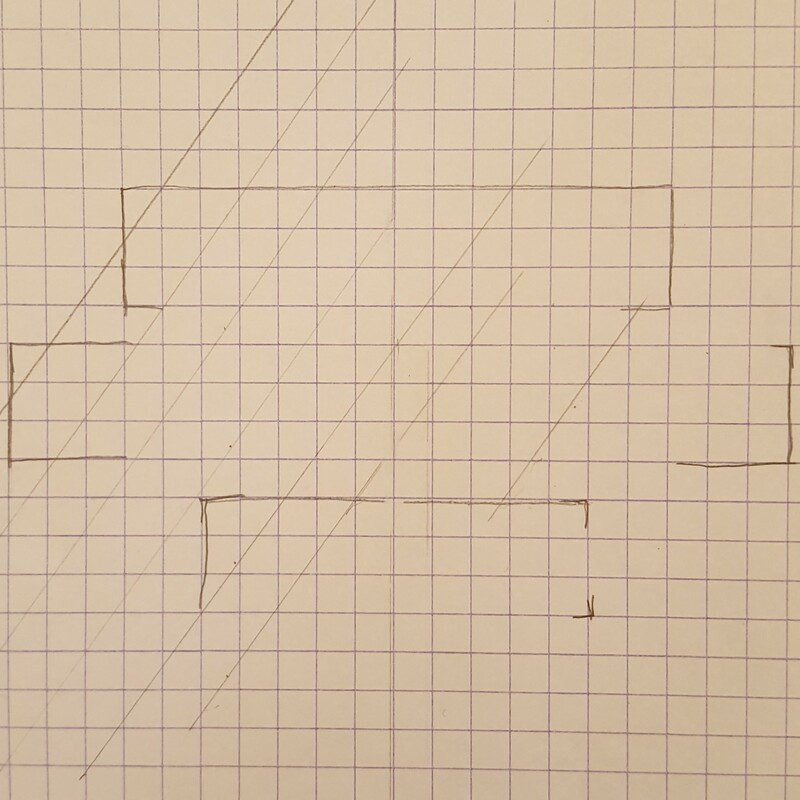 I drew boxes on my graph paper guide sheet to map out where each line should begin and end. I fitted the area of the invitation to be lettered over my guidelines and drew lines on the graph paper to mark the edges of the invitation. That way I wouldn’t have to align each invitation as I started it. These lines I marked with blue tape to make it even easier. I taped the edges of each invitation down as I worked in order to avoid the inevitable drifting of the paper. The margin for error with this project was 0, so I had to be very thoughtful and careful with each step. I also cleaned the nibs regularly as I wrote because, depending on the paper, as you’re working, the nib picks up fibers from the paper and this really puts a damper on the elegance of your script. After the first couple invitations, I actually added a couple more guidelines in red ink to mark the tops of the capitals. I also ended up sealing the surface of the paper with a fixative before I lettered on it in hopes it would make the paper less absorbent. 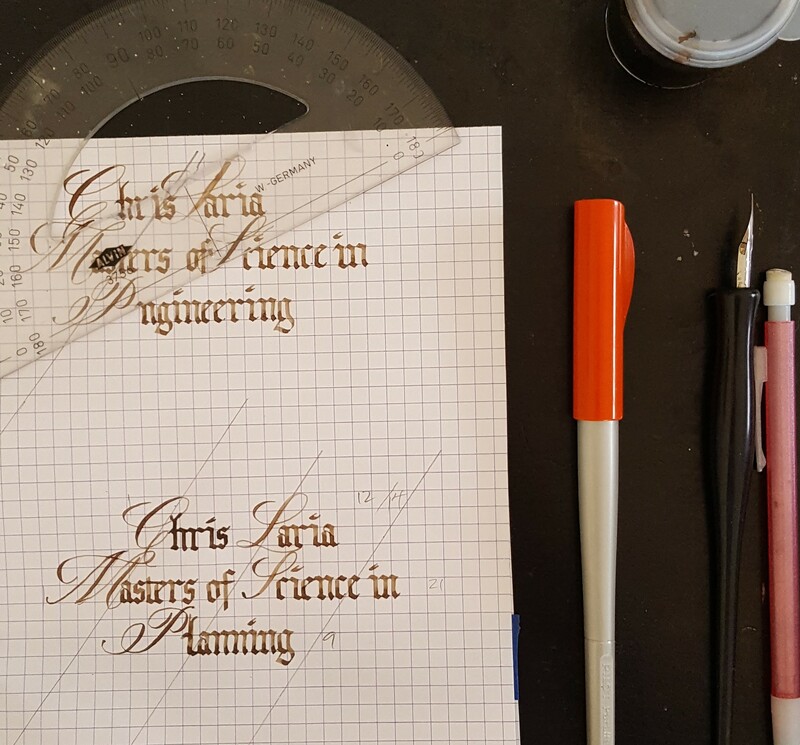 That way the walnut ink would rest on top of the paper and dry more correctly to its unique beauty and the nibs would glide more easily over the paper, picking up fewer fibers. This step seemed to help and the client was very happy with the results.